If you have been researching different paddle kayaks to go fishing in, then I am sure you have come across the range of Perception Pescador Pro kayaks. After looking into these kayaks more myself, it became apparent what all the fuss is about. So I have written a full review of the Perception Pescador Pro kayaks here to give you as much information on them to help you make an informed decision. There are two kayaks available in the Perception Pescador Pro range, the Perception Pescador Pro 10.0 and the Perception Pescador Pro 12.0. The two different versions vary in size, with the 10.0 model reaching 10’ 6” in length, and the 12.0 reaching 12’ in length. Both of these kayaks have a sit-on-top design, which is ideal for fishing as it gives you more flexibility to move around and utilize more space within the kayak with your fishing gear and accessories. What I loved about the design of the Perception Pescador Pro kayaks is that they are very spacious. The hull is quite wide, so not only do you have that extra bit of stability due to the wideness, but you also feel that you are not squeezed into a tight spot and you have plenty of room to move around and store your fishing gear. The quality of the kayaks also feels very good. As soon as you start to look over all of the design elements you can see that a lot of thought has gone into the layout, and also the quality of the build is extremely high. Both Perception Pescador Pro kayaks are surprising light too. Carrying them from your vehicle to the water should not be a problem, and this also gives you more ability to access waterways that other heavier kayaks may not be able to reach. The hull of the kayak is made from polyethylene, so it is light and extremely durable. There is also a skid plate added to the bottom of the hull to provide added durability. You can expect to get many years of usage out of your Perception Pescador Pro. One of the biggest gripes for many kayak anglers is the lack of comfort, as so many kayak designs have put their focus on other areas. But that cannot be said of the Perception Pescador Pro, as comfort levels has clearly been out high up in the thought process when designing them. The stadium style pro seat gives you a nice big cushioned area to plant your bum, and even if you are of a larger build you will find there is plenty of room, and cushioning to support your weight and size. The backrest of the seat also provides some much needed support when spending hours out on the water. Also the seat has two adjustable positions, so you can set it in the optimal position for your requirements. The seat is also removable if you want to take it off to clean or while traveling. The size of the cockpit allows you to move your legs around freely, which again is a very important factor when spending a long time in the kayak. There are adjustable foot braces so you can plant your feet in the most comfortable position while paddling out to your fishing spot. While the Perception Pescador Pro kayaks are not as feature-heavy as some other models, you still get a lot of the essential design features that you would want in a fishing kayak, and a few other very well received ones too. First of all, you have tank-wells on both the bow and stern of the kayaks that have been moulded into the design. The tank-wells on the Perception Pescador Pro 12.0 kayak are larger in capacity than on the Perception Pescador Pro 10.0 version. On both versions, the stern (rear) tank-well has bungee keepers to hold your tank in place, and the bow (front) tank-wells have a mesh gear cover to ensure you don’t lose any of the fishing equipment. If you want to add a fish finder to the kayak, you have a storage console that will be able to house all of the electronic components and battery. There is also a small hatch at the stern of the kayak that gives you access into the interior of the hull. There is also a small dry storage area in front of the seat, so you can store things like your wallet and phone. It is not very specious though, so you won’t be able to fit much more than a few smaller items. In the middle of the kayak, you can a convenient recess that can easily hold your tackle boxes, and any other gear that you want easy access too. There is also a cup holder moulded into the kayak’s body, so you can keep that early morning coffee at hand while you are out on the water. The Perception Pescador Pro kayaks come with dual rod holders that are moulded into the body of the kayak, just behind the chair. This allows you to keep your rods out of the way while you are paddling out to your destination, and also you are able to quickly and easily access them when needed. Only having two rod holders built into the design of the body is less than some other kayaks have, but you always have the option of purchasing additional rod holders that can be attached to the kayak if required. You can do this by using the excellent YakAttack Gear Trac system, that allows you to easily attach other rod and paddle accessories to the kayak, and fix them in the optimal positions for your own personal requirements. There are also paddle-parks, so if you want to store your paddle out of the way while you are fishing you can do so by simply clipping the paddle into this convenient parking system. There are two carry handles attached to the Perception Pescador Pro kayaks, one at the bow and another at the stern. There are also handles at each site around the position of the chair that have been moulded into the design, to give you a sturdier grip when picking the kayak up from the side. One thing that really stands out on the Perception Pescador Pro kayaks is their tracking ability. They seem to glide through the water effortlessly, and stay of a true course, making your paddling that much more efficient. The kayaks are very easy to turn as well, so if you are in tighter spots and you need to manoeuvre around structure, you will find this quite easy to do. Even in the larger Perception Pescador Pro 12.0 model, the manoeuvrability is impressive. Both Perception Pescador Pro kayaks are designed to be stable, but due to their fairly thin depth, they are more suited to calmer waters. While you can certainly take both models out into open water, you would not want to do so if conditions are poor and the water too choppy. You can stand to fish in the Perception Pescador Pro, but you do need to be mindful of your balance, and do not make any rash movements. But if you are fishing on flat water, then standing is definitely possible. 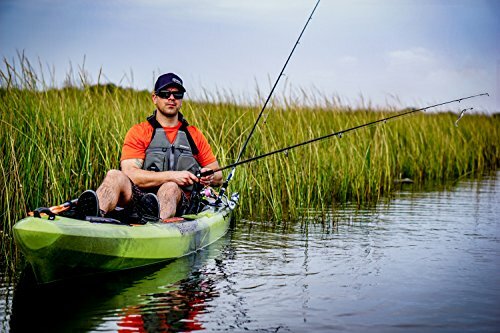 The ideal water types for the Perception Pescador Pro kayaks is lakes, ponds, slower flowing rivers, estuaries and calmer coastal waters. 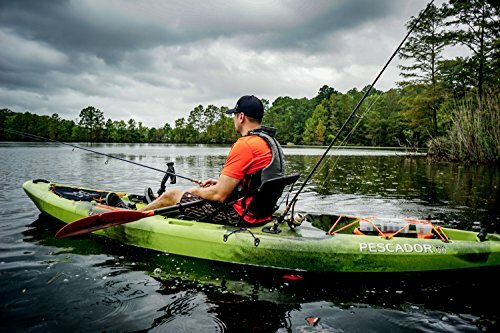 The Perception Pescador Pro kayak, whether it be the 10.0 or the 12.0 model, is ideal for the beginner up to the intermediary level of kayak angler. The design is excellent, every aspect has been well thought through with so it is not only very comfortable to sail, but also you will have everything you need within easy reach. If you are looking for a good quality kayak at a reasonable price, then the Perception Pescador Pro certainly delivers. With the two sizes available, you have good options to suit your kayak fishing needs.